For thirty years, the University of Oregon has trained students for professional careers in planning. Why do students choose the Department of Planning, Public Policy and Management (PPPM) at the UO to pursue their goals? Sustainability: Oregon and the University of Oregon are world leaders in planning for sustainable communities through courses, research, and applied learning like the Sustainable Cities Initiative. Experiential: You don’t just read about planning—you do it. You work on real projects with real clients from your first term through your Community Planning Workshop (CPW) team. Community. PPPM students are leaders and have an active role in the department and community. Whether it’s working on social justice or winning prizes for the Polar Plunge, our students often develop lifelong friendships. Excellence. We’ve been ranked in the top ten programs in the US for faculty publications and environmental planning. Faculty members are friendly and accessible, and work closely with master’s degree students. Flexibility. Our flexible program allows you to choose a focus that suits your background and career goals. You can also obtain concurrent degrees with several departments or within PPPM. Northwest. The Pacific Northwest is not only a beautiful place to live; it is also a place of innovative thinking and governance. 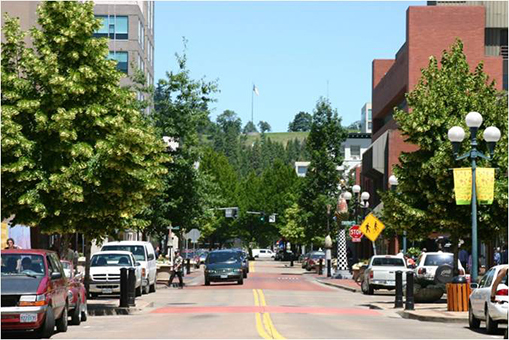 Oregon is recognized internationally for its leadership in land use planning, compact urban development, and collaborative governance. The Master of Community and Regional Planning Program seeks high-caliber, motivated, and mature students interested in a challenging and applied curriculum. The University of Oregon values prior life and work experiences, whether it is military service, a first career, Peace Corps, or planning-related work. The UO’s Department of Planning, Public Policy and Management encourages students from all backgrounds to apply and believes a diverse program better prepares students and better serves communities. The University of Oregon is committed to providing equal opportunities for all students, faculty and staff members, inclusive of ethnicity, heritage, gender, sexual orientation, ability, socioeconomic standing, cultural beliefs, and traditions. Visit http://pppm.uoregon.edu/prospective/crpchecklist to learn how to apply. Make plans to visit us or attend an open house. If you have questions, please contact the Graduate Coordinator choquett@uoregon.edu or call 541-346-3851. Want Career Experience Before Applying? Resource Assistance for Rural Environments (RARE), an AmeriCorps-sponsored program, provides twenty to thirty participants a year-long work experience in small or rural Oregon communities. The experience encompasses a wide range of responsibilities, and participants typically have the opportunity to take on significant assignments and an array of tasks. Participants receive salary, benefits, and earn an educational award, and are eligible to apply for Oregon in-state tuition. Learn more at http://rare.uoregon.edu. This program is featured in Planetizen's Guide to Urban Planning Programs.